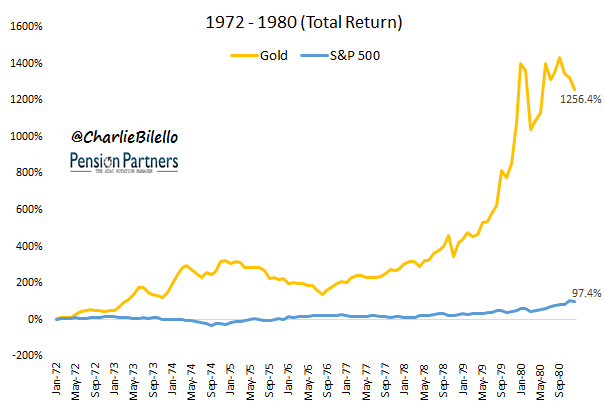 Which is the better investment: Gold or Stocks? It’s a battle as old as markets. Gold Bugs and Stock Market Bulls are equally fervent about their investment of choice, often with complete disdain for the other side. Narrative: Gold is the best investment in the world, and will continue to be so forever. There is hyperinflation in the U.S. and a secular stagnation in real growth. The only way to protect yourself is with Gold. And by the way: no one should own stocks. Data sources for all charts/tables herein: Stockcharts.com, Bloomberg. What returns are you expecting from stocks and bonds over the next 7 years? This is a question that GMO (one of the largest and most respected asset managers) attempts to answer on a quarterly basis. Their most recent forecast was downright depressing: -2.2% per year from large cap U.S. stocks and +1.9% per year from U.S. bonds. If correct, it would mean a 60/40 portfolio of U.S. stocks and bonds would generate a return of -0.6% per year over the next 7 years. 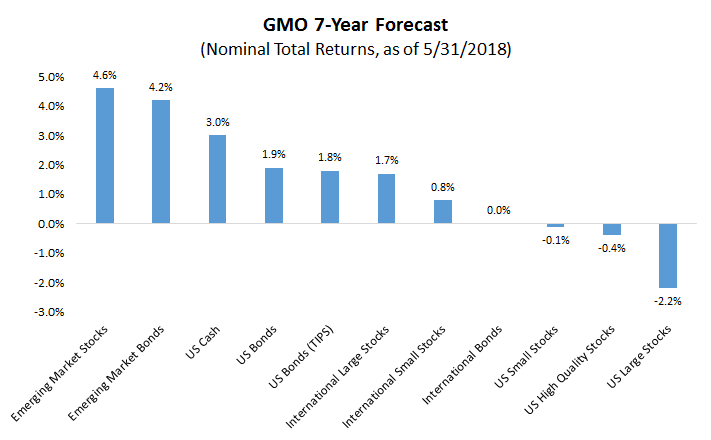 By comparison, GMO is expecting +3% per year from cash, implying that there is little to be gained today from taking risk. Source: GMO.com. Note: Nominal Total Return derived from GMO’s real return and adding their inflation assumption of 2.2% per year. When I look at charts like this, sayings such as “cash is trash” or “there is no alternative” come to mind. 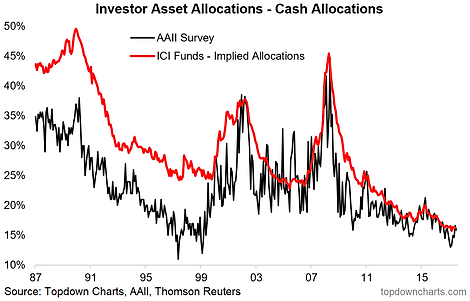 The chart uses data from the AAII survey and ICI mutual fund statistics to give two views on US investor portfolio allocations to cash. The bottom line is cash allocations are at rock bottom. Interestingly though, the AAII surveyed allocation has rebounded from the low-point in January this year. Question is, how many Fed rate hikes will it take until cash looks attractive again? …but then again, interest income isn’t always all that matters, when the core job of cash in a portfolio is typically to do the heavy lifting as a defensive asset for capital preservation purposes. So contrarians: take note. Driving south on I-5 into Seattle, the Cascadia Subduction Zone came to mind, especially when the highway dipped into a gloomy tunnel beneath Seattle’s relatively new skyscraper district. This fault line runs along the Pacific coast from north of Vancouver down into California. The western “plates” move implacably east and downward under the North American plate, building up massive tectonic forces that can produce some of the most violent megathrust earthquakes on the planet. Through it all (i.e., despite trade uncertainty, Italy’s political drama and ongoing concerns about the sustainability of the domestic political situation as Trump remains at odds with the nation’s top law enforcement agencies and intelligence apparatus), U.S. equities managed to turn in their best May performance since the bull market began. On May 20 we presented a case in NFTRH 500 that the bearish bond play (bullish yields) was done, at least temporarily, from a contrarian perspective. The day after this bond maturation yields again went up (bonds down) as the stock market shook off the media-manufactured fears that ostensibly started in Italy but actually were destined to crop up regardless in one place or another (there was a lot of trade war noise this week). See this NFTRH Premium update, now unlocked to the public, as it was presented in-day and in real time to give perspective for subscribers (and myself) as the media were scaring the herds into risk ‘off’ behavior and the perceived safety of Treasury bonds. But on some days, the stock market would get mysteriously strong. It would usually occur mid-morning. Often stocks would sag near the open, look like they wanted to break lower, when all of a sudden – out of the blue – stocks would go bid. I couldn’t understand it. There was no “reason” why they should be rising. Yet they did. Yes, “what a total mess.” And for Christ sake, will someone please teach him what a proper noun is or, more to the point, what a proper noun isn’t? One hundred and six months. The current expansion, having emerged in the aftermath of the collapse of the mortgage finance Bubble, is now the second-longest on record (lagging only the 120-month 1990’s Bubble period). The unemployment rate dropped to 3.9% last month, the lowest level since the 3.8% print in April 2000. Corporate earnings are at unprecedented levels and stock prices only somewhat below records. Home prices in most markets are at all-time highs. U.S. GDP is forecast to expand 2.8% this year, just below 2015’s (2.9%) 12-year high.